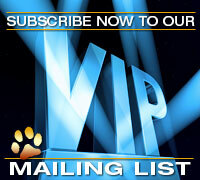 The Standard Poodle: What Should You Look For? I continue with my in-depth breed conversations with diverse breed authorities. Today, we discuss the Standard Poodle and who better than to converse on the breed than Mr. Wendell Sammet of the famed Ale Kai Standard Poodles. 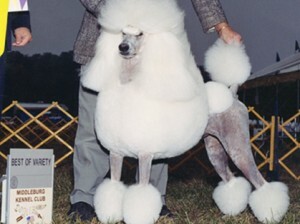 Mr. Sammet began his illustrious, lifelong Poodle passion in the beginning of the 1950s. What started as a career quickly developed into a lifetime bond with the breed, beginning as a professional handler of miniature poodles for the prominent Hollycourt Kennels, New York. Over a relatively short time, his reputation preceded him and in 1952, Mrs. Henry J. Kaiser of Ale Kai Poodles, Hawaii, retained Wendell’s professional handling services for her Standards. Their partnership lasted until 1990, whereupon Mrs. Kaiser’s death, Ale Kai and its operations were bequeathed to Wendell Sammet. During their nearly 40 year relationship, Wendell and Ale Kai were honored with a number of outstanding achievements beginning with Ch. Tammy Tambourine de la Fontaine, who was awarded Best of Variety (BOV) from the classes over breed Specials and placed third in the 1952 Westminster Kennel Club Non-Sporting Group competition. In 1967, Ch. Alekai Marlaine won BOV and the Westminster Non-Sporting Group. Finally, while Mrs. Kaiser was alive, Wendell brought home another 1988 Westminster Non-Sporting Group win with Ch. Alekai Airy. 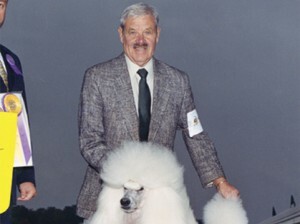 After Mrs. Kaiser’s passing, Wendell continued the acclaimed Ale Kai Poodle breeding program and triumphed with two consecutive Westminster Group wins in 2003-2004, with Ch. Ale Kai Mikimoto On Fifth, with co-owner Mrs. Karen LeFrak of On Fifth. 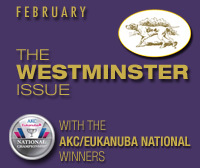 All total, Ale Kai Standard Poodles have been crowned with four Westminster Kennel Club Group wins and a third Westminster Group placement. I would be remiss not to highlight the important laurels and achievements of a sporting gentleman such as Mr. Sammet. He was awarded the 1993 Dog Association Writers of America Best Club Publication for his illustrated breed standard for the Poodle Club of America. In 1997, he was bestowed with the Gaines Dog Handler of the Year award. In 2002, Mr. Sammet was named AKC’s Breeder of the Year, the first of its kind, which was followed by the 2004, Dogs in Review annual Winkie Award for Best Breeder Owner Handler. In 2007, Wendell Sammet was inducted into the Anne Rogers Clark Hall of Fame sponsored by Pro Plan Show Dogs. The introduction of the poodle begins with Wendell illuminating the greatest misconception about the breed. The misdemeanor that the Poodle is a retriever, which is false. The Poodle himself is a companion dog whose origin for retrieving waterfowl did descend from the water dog but as the muddy marshes and ponds dried up due to civilization expansion, waterfowl and the hunting thereof decreased and the Poodle eventually became a companion dog. A performer of tricks, as a mascot for Royalty, the wealthy class admired him for his temperament, intelligence and style. The Poodle standard of England written in 1886, “The Perfect Black Poodle” described the poodle–not a retriever. In 1905, the Poodle Club of America adopted this standard with changes and is today the breed blueprint for a poodle, not a retrieving gun dog. The poodle’s appearance is elegant, squarely built, having an air of distinction peculiar to himself. The retriever’s appearance is slightly longer than tall, 12:11, with a strong body of correct bone density, contributing to his strength and durability. Wendell expresses his considerable exasperation with a common misinterpretation of the breed’s proper gait. The poodle’s gait is beyond compare to a retriever’s gait. The poodle’s side motion is off the ground at a steady pace, not hackneyed, but carrying himself proudly with a light, springy action. In contrast, the retriever side gait is strong and steady, with strong reach and driving action covering the ground efficiently in low strides, with a fair amount of speed. Envisage he and I center ring, shoulder to shoulder, reviewing a lineup of Standard Poodles in traditional trim. Instruction begins with the first rule of thumb when judging this breed: these dogs have manufactured, sculpted silhouettes and he is emphatic that you cannot trust your eyes, as you are unable to judge, by eye, what is under the hair. The coat of the Continental Trim covers 2/3 of the dog with hair, and both the English Saddle and Puppy Trims or clips cover the dog. Our lineup may all look quite beautiful standing, but virtues and faults must be determined by hand. The silhouette is indeed an elegant appearance, properly clipped and carefully groomed, a dog who is squarely built without exaggeration, standing proud with both head and tail held naturally high. Incorrect forequarters are problematic in almost all breeds with the Standard Poodle being no exception. 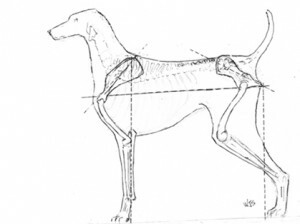 To evaluate the forechest and quarters, you must know and apply the blueprint, keeping in mind that 50% of the dogs weight is carried on the thoracic girdle and limbs. For breed type, we begin with the essential: a strong, arched neck to carry the head naturally high. Such a neck must blend smoothly into obliquely set shoulders, in which the bones of the scapula and humerus are equal in length. Key aspects of the forequarters are well laid back shoulders and well set under humerus, which control forward reach and the momentum of arc. When judging, it is very helpful to utilize an imaginary plumb line which, when dropped down from the uppermost point of the scapula blades, the line will contact the heel of the front foot. There must be a slight prosternum felt–not a keel–though many times today one feels shallow, concave chests. The prosternum is attached to a deep chest cavity extending to the elbows. Elbows should be tucked-in accompanying straight fore legs having proper bone, neither too fine or coarse. It is necessary that there be a gradual rise and slope of the thorax (underline) to the tuck-up with well sprung ribs, neither slab-sided or barrel chested this allows for expansion of the diaphragm. An important but often overlooked feature of the breed Wendell emphasizes is the poodle’s feet which are supposed to be oval shape–not terrier–for breed correct, springy gait. Today we often see not only terrier feet but also many are barely visible, hidden by excessive hair from the untrimmed cuffs. Many judges do not realize the requirement is for feet to be exposed! The back or rather, the trunk is most likely one of the most misunderstood aspects of the poodle. This is a breed that should be square. Unfortunately, due to a lack of judicious study, many fanciers anticipate a poodle as being short-backed and tall. Today, frequently we observe poodles of high station who are much too leggy. This is completely out of character for such a proud breed, in reality such a dog is quite out of balance, measuring taller than long. Such high station accompanied by too short a back has a tendency to roach. Wendell desires leg length of 55/45 ratio — that is to say the leg length from elbow to ground is 55 percent of the dogs height. With this ratio, it allows for a poodle to be square measuring equal in height from ground to withers and from point of shoulder to point of rump. The correct Standard Poodle has a level back with a slight hollow that will occur behind the withers at the anticlinal — the point where the spinal column vertebrae change direction — and continues having a slight arch over the loin. A slight rise over the loin adds strength and power to his rear drive however, a slight rise is not to be confused with a roached back. Of course, all this must be felt due to the coat. Another point of contention on the anatomy of a correct Poodle is the croup. Breeders and judges alike should keep in mind that the pelvic girdle and croup determines tail set, and desirable is a 30 degree slope of croup with the tail set on moderately high. Far too often steep croups and low tail sets are found, sometimes with as much as a 40-45 degree slope. On correct specimens, a properly sloped pelvic girdle ischium tuberosity’s create a definite shelf extending past the moderately high tail set. The existence of a shelf allows for maximum muscling attachment (width) in the hindquarters. Because the angle of the pelvis dictates the width of the stifle, a steep and incorrectly angled down pelvis with low tail set significantly diminishes the shelf or effectively eliminates it, thereby decreasing the area for essential muscling. These muscles include the second thigh which is critical for drive, yet is lacking in many of the dogs today. Here again the imaginary plumb line is used, dropping from the point of rump, landing just slightly in front of the rear feet. The hindquarters should be built with equal length of femur and tibia ending with a well-let down hock that lends itself to endurance, differing from a high hock that is built for speed. We observe far too many sickle hocked dogs which indicate unequal length of the pelvic limb bones. The Poodle carriage and side gait is the epitome of breed type. As we observe in motion, his head is ideally carried between 10 and 11:30 on the clock. The dog with straightforward gait describes a dog who immediately steps off and leads with its front leg into a light, springy forward drive. He requires no winding up as some dogs need a few strides to achieve forward momentum. On this note it is important to instruct judges of the proper speed of gait. This dog is not to be raced around a ring, seemingly in a flying trot. He is to be gaited at an easy pace so the judge can observe a light, springy, ground covering trot. Racing, flying gaits are strongly discouraged. One of the most obvious characteristics of the Poodle is the coat. Originally, the only dog registered as a poodle were corded coats. During that time, those without cords were registered as “pedigree unknown” and had curly coats which were shown brushed out. Today the coat appearances have changed dramatically. A correct coat texture is very difficult to determine or predict due to cosmetic additives therefore, one should attempt to ascertain texture on the shorter cut hair found, e.g., the tail or the sides of the dog. Correct texture is when the hair bounces back after the hand is removed. Regrettably, today the caricature poodle coats are excessive with topknots commonly styled as Marie Antoinette. Many may be greatly surprised to learn that when Wendell began handling in the 1950s, topknots used only one rubber band and were about 6 inches in height. It is not unusual today to find 5-6 bands in superfluous, ornate topknots. Here Wendell wraps up his mentoring with the proportions of the head piece. The skull is moderately rounded with a slight but definite stop. It has flat cheekbones with length of skull, balanced with that of his fore face. The long, straight and fine muzzle has slight chiseling under the eyes and is strong, without ‘lippiness,’ the chin definite enough to preclude ‘snipiness.’ It is not uncommon nowadays to see Roman nosed and down-faced muzzles with shortened fore faces. The dog’s eye should be dark and oval in shape, with no deadpan expression. Ears should hang close to the head, and are wide and thickly feathered, whereas too fine an ear leather typically does not have an abundance of feathering. In conclusion, Wendell goes on to qualify an over and incorrectly used expression. He speaks of the reference “being poodly” used as a generalized term to describe a poodle who is acting up, wired, or in a flying trot, all of which are the antithesis of the breed. Many fanciers do not have the vaguest notion they are using this term incorrectly. The phrase was coined to describe a poodle whose carriage and demeanor was proud with head and tail carried high with having an air of distinction peculiar to himself. Posted by admin on Aug 9 2013. Filed under Current Articles, Featured. You can follow any responses to this entry through the RSS 2.0. Both comments and pings are currently closed.